Defending champions ENGLAND (+14) retained the European Nations Championship in Spain. Their 878 total was 8 shots better than The Netherlands (+22). IRELAND (+23) were third and WALES (+29), who recorded the lowest final day score (213), were an encouraging 4th. SCOTLAND (+37) had a poor final day and fell to 8th. Tom SLOMAN (ENG) won the Individual competition with a 294 (+6) total. His final round 77 looked like it would cost him the title but an eagle on 14 and three closing pars ended up being sufficient as other faltered on the challenging Sotogrande course. Caolan RAFFERTY (IRE) +8 finished 4th, Euan WALKER (SCO) and Ben CHAMBERLAIN (WAL) +9 tied 5th and Tom PLUMB (ENG), Jake HAPGOOD (WAL), Bailey GILL (ENG) and Conor PURCELL (IRE) +10 tied 11th. Young Archie DAVIES (WAL) became the first player to shoot in the 60’s during the Championship. His final day 69 (-3) included six birdies. 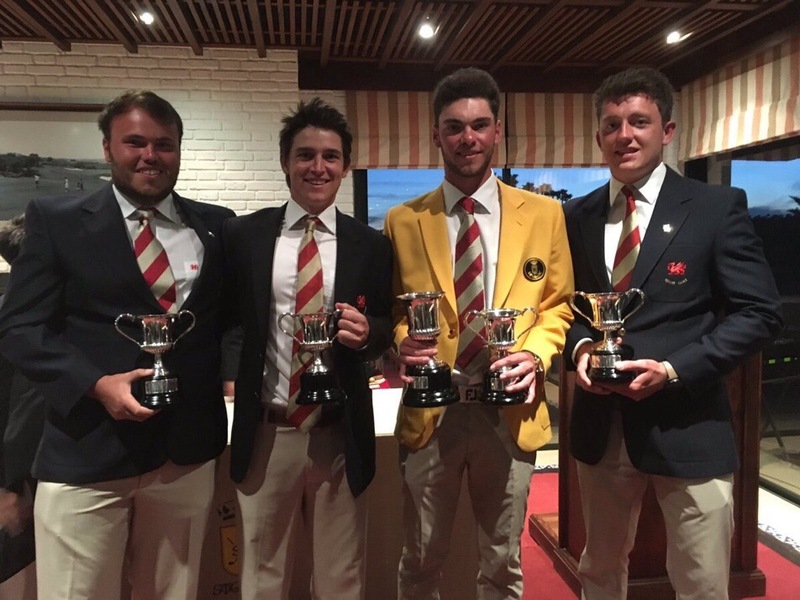 The Men’s European Nations Championship (ENC) starts on Wednesday 10th April at Real Club de Golf Sotogrande in Southern Spain. RCG Sotogrande is the permanent home of the ENC and this will be the 13th playing of the event. This year 15 four-man teams (60) will play for a Team prize whilst a total of 69 players will contest the Individual competition. 9 players have been invited by RCG Sotogrande and the Spanish Golf Federation to complete the field. *A late replacement for James SUGRUE who was injured in practice. Of these just Ben Chamberlain, Jake Hapgood and Caolan Rafferty played in the event in 2018. A Women’s ENC also takes place alongside the Men’s competition. Three women teams from England and Scotland are both competing. 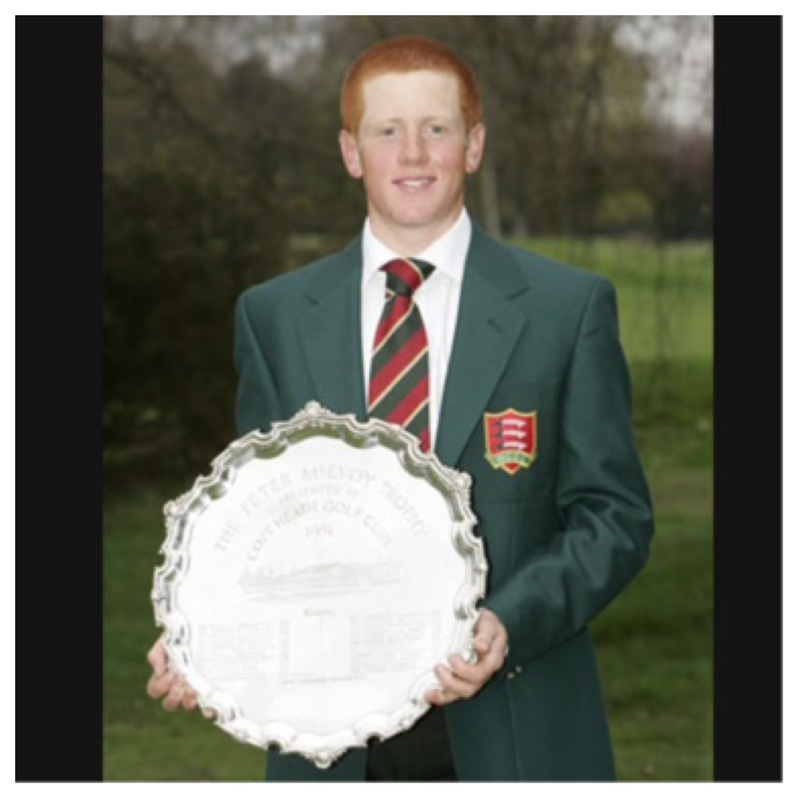 In 2006 The Sherry Cup was rebranded as the European Nations Cup and in 2017 become known as the European Nations Championship played for the Sotogrande Cup. The forecast looks good albeit as always the winds will be a factor, particularly in the afternoon. This can cause problems given the numerous water hazards on the course. The home nations have an excellent record in the Men’s Team event. Of the other competing home nations Ireland finished second on 873 (+9) and Wales 11th on 910 +46. Scotland didn’t play in 2018. Todd secured the Individual title with rounds of 69 73 71 and 70 for a 283 total (-5). Five shots back Ireland’s Alex Gleeson (76 74 69 69 / Ev), Denmark’s Rasmus Neergaard-Petersen (72 75 72 69 / Ev) and Gian-Marco Petrozzi (69 71 76 72 / Ev) all tied for second place. Matthew Jordan (71 76 76 68 / +3) finished tied 5th and David Hague (79 73 74 68 / +6) 11th. Ireland’s Caolan Rafferty (72 79 74 71 / +8) was tied 12th and compatriot Jonathan Yates (77 74 72 75 / +10) tied 20th. 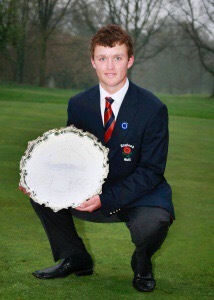 In form Charlie STRICKLAND from Ham Manor Golf Club, near Littlehampton on the south coast of England, won the 2017 McEvoy Trophy at Copt Heath Golf Club. His rounds of 70 72 68 and 66 gave him a -8 total on the par 71 West Midlands course. Having won the Duncan Putter at Southerndown last weekend the McEvoy represented a second big win for Charlie in the space of just a few days. Jannik DE BRUYNE from Germany was second on -5 and Angus FLANAGAN third on -4. The 2017 Peter McEvoy Trophy will be contested on Wednesday 12th and Thursday 13th April at Copt Heath Golf Club in Solihull, England. 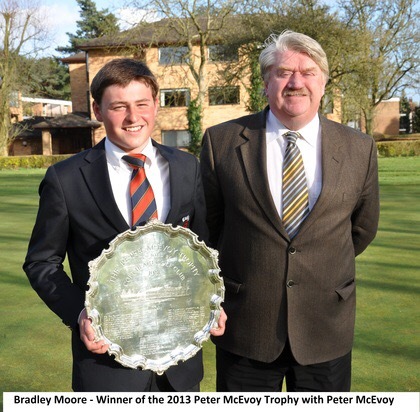 The McEvoy Trophy is a 72 hole scratch stroke play medal competition played over two consecutive days by Under 18 Boys (on 1st January). The format, limited daylight and the greater risk of poor weather in April means the field is sensibly restricted to 72 players. A handicap ballot is applied to the entrants in what is always an oversubscribed event. Live Scoring on the Club’s website – updated after each nine on Day 1 and more frequently for the leaders on Day 2 – makes it easy for family, friends and other interested observers to keep up to date with play. The cut-off handicap this year was +0.2 with 69 of the field having handicaps of scratch or better. Click here to view the McEvoy Trophy Rd 1 and Rd 2 startsheet. 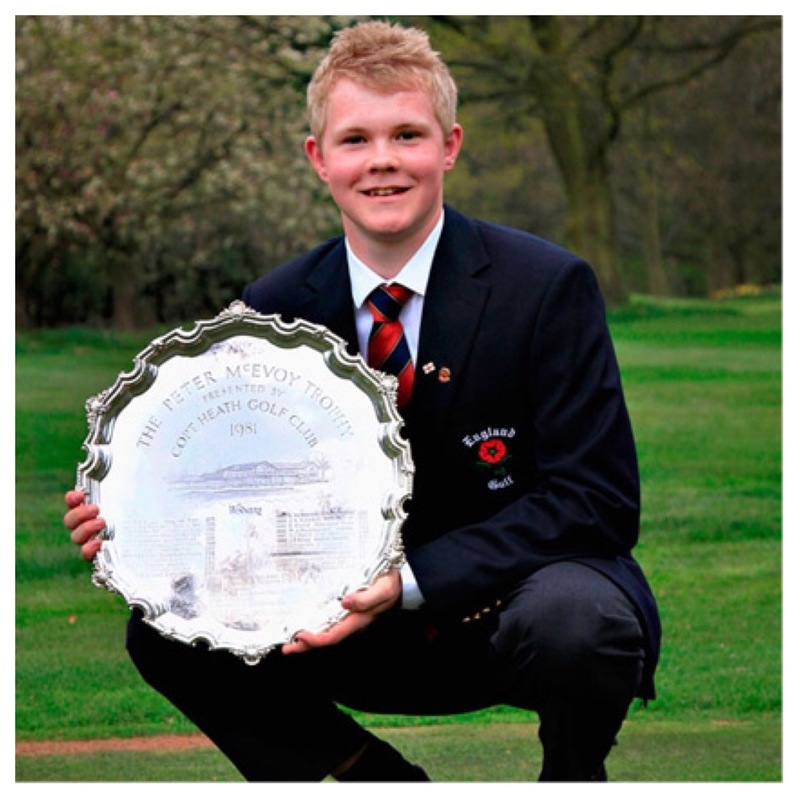 Jack AINSCOUGH (ENG) – runner up in the 2016 McEvoy Trophy (-5). Nick BACHEM (GER) – winner of the 2016 Fairhaven Trophy. 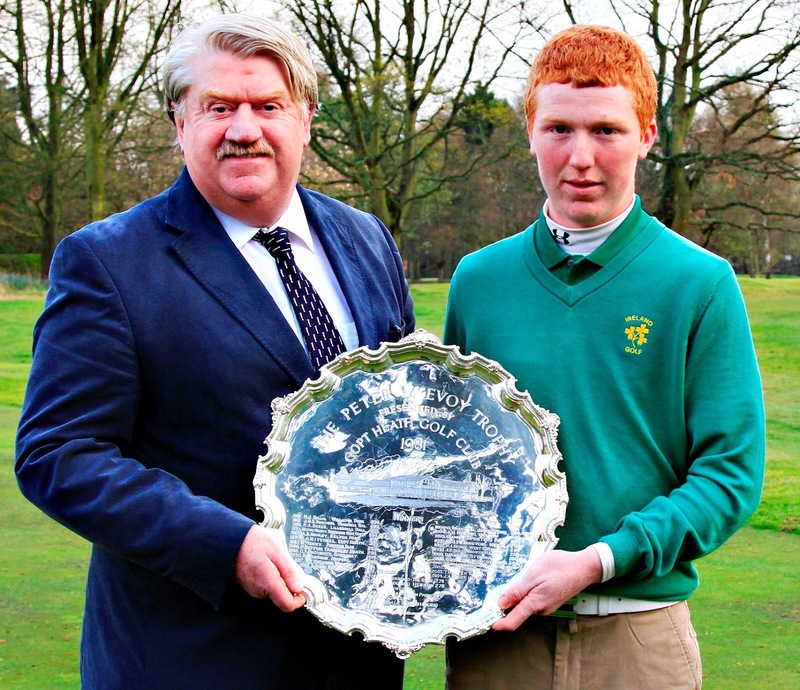 John BRADY (IRE) – 2016 Irish Boys U16 champion. Toby BRIGGS (ENG) – 3rd place in the 2016 McEvoy Trophy (-4). Angus FLANAGAN (ENG) – winner of the 2016 Carris Trophy (English U18 Boys’ Open SP Championship). 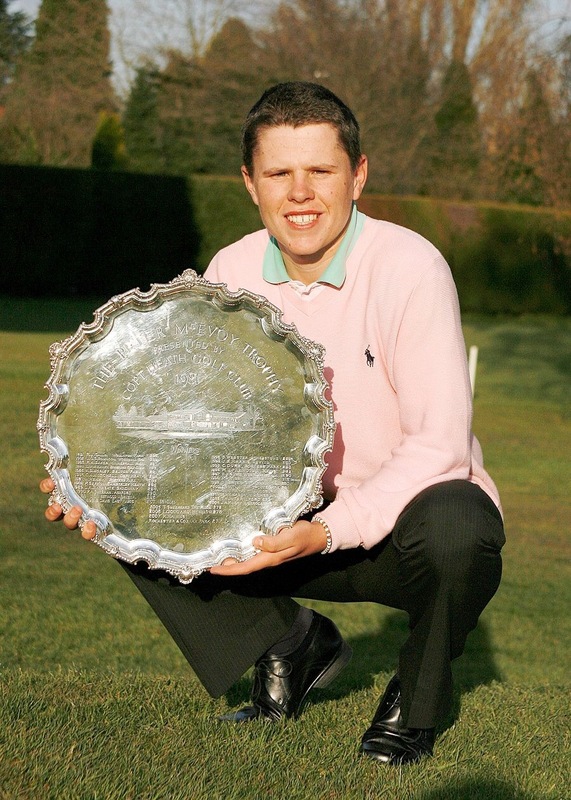 Michael GILBERT (ENG) – winner of the 2016 Sir Henry Cooper Junior Masters. 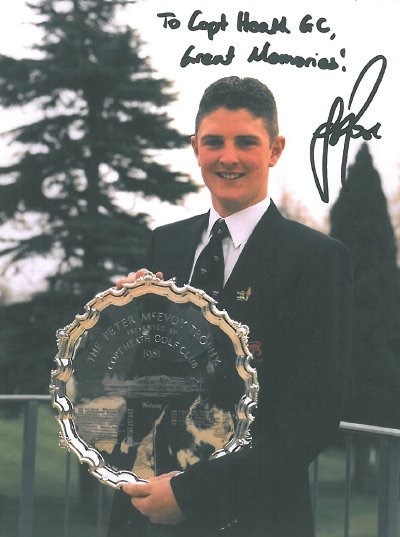 Mark POWER (IRE) – defending McEvoy Trophy champion (-7) and 2016 Irish Boys U18 champion. 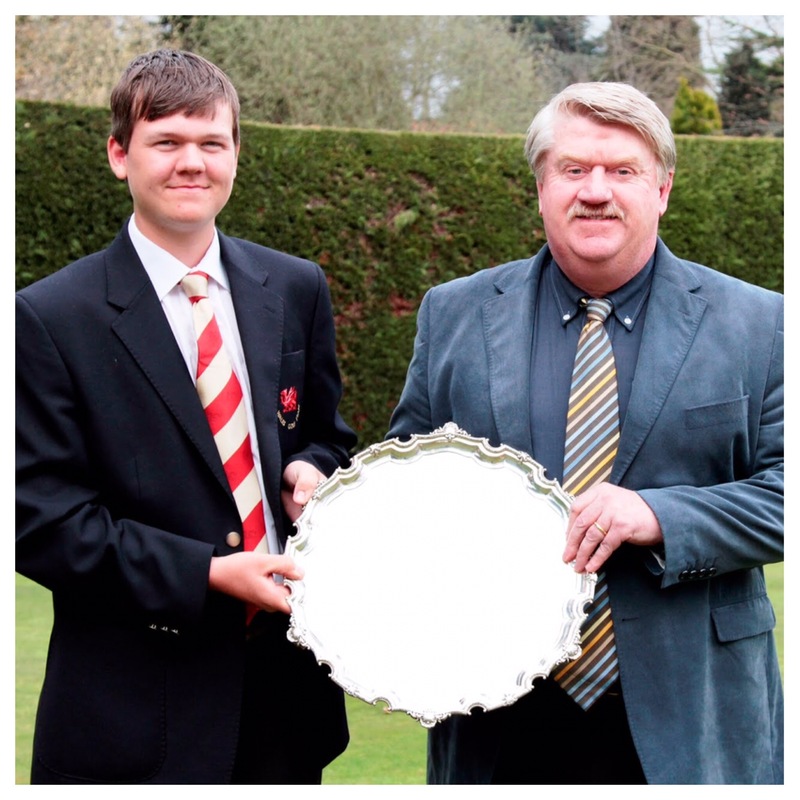 Charlie STRICKLAND (ENG) – winner of the 2017 Duncan Putter. In addition to Nick Bachem there are a further 9 entries from Germany. Henry Lai and Timo Thanks have also entered from The Netherlands. Robin WILLIAMS (ENG) from Peterborough, having returned from a golfing high school scholarship in Florida, was the lowest handicap entry at -4.0. Unfortunately this year the McEvoy clashes with the Scottish Boys SP Championship being held at Moniefieth so there are no entries from north of the border. Whilst few of this field would have made the handicap ballot the entry list is certainly weaker for the absence of Darren Howie, Eric McIntosh and Jamie Stewart. Dry but cloudy conditions are forecast for the two days of competition. Copt Heath, despite its name, is essentially a parkland course. The current course was designed and built in 1913 by Harry Colt, the famous course architect, and is predominantly flat but well protected with around 95 deep bunkers. In the last few months the 8th hole, a short par 4, has been improved with fairway bunkers added and the green reduced in size. Otherwise the course is generally as it has been for many years. Legendary British Amateur golfer Peter McEvoy OBE has been a member of Copt Heath for 52 years. If you would like to learn more about his career then click this link for my profile – Peter McEvoy. Starting in 1981, The Peter McEvoy Trophy was originally held during August. In 1985, at the request of the English Golf Union, it was moved to April, where it has stayed ever since. This request was prompted by a need for an early season national competition to assist them with the selection of their team ahead of the Boys Home Internationals and European Championships held later in the year. The Peter McEvoy Trophy has an enviable list of former winners, reflecting both the quality of the annual entry but also the fair challenge presented by the course. In 2013 Justin Rose became the first McEvoy Trophy winner to win a Major Championship, when he won the U.S. Open at Merion GC.